The Chaser Inn at Shipbourne is a Grade II listed building. It dates back to the 15th Century when it was a coaching inn. By the 18th Century it was part of the Fairlawne Estate. Today it nestles between church and houses overlokking a Kent village green. The Chaser Inn has a good reputation for food and is litsed in both the Good Food Pub Guide and the Good Pub Guide. The building has a central courtyard which was used extensively in the summer months. The Challenge was to give customers that same ‘al fresco’ dining experience all year round. Brian Keeley-Whiting (owner) was keen to see a solution that was in keeping with his courtyard tables and chairs. As the Courtyard is an irregular L Shaped space, a custonised solution that could maximised the available area was essential. Barkers Marquees designed, built and installed a custom built Pergola Marquee which fits the courtyard perfectly without having to attach to the existing Grade II building. As a Pergola Marquee is a hybrid between a marquee and a garden pergola there is no need in the majority of cases to involve Local Authorities for lengthy Planning Permission. It provides the Chaser Inn with 36 dining covers all year round and as Darren Summerton (Manager) says ‘ is fantastic for the Christmas trade’. 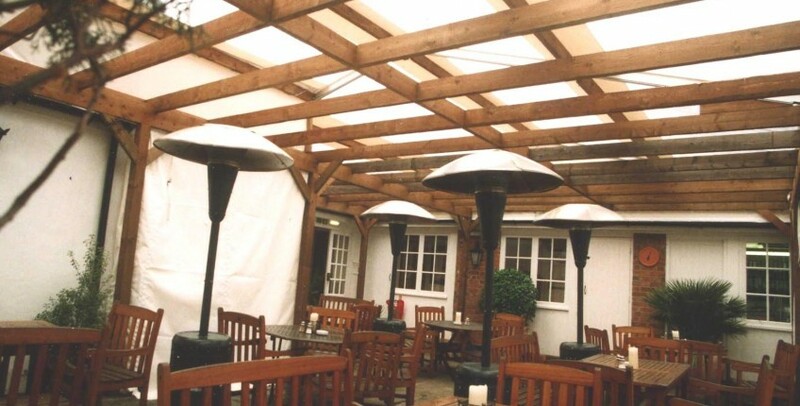 During the summer the wooden pergola remains giving an attractive al fresco experience; in the Autumn the roof and wall panels are easily replaced and patio heaters maintain a very comfortable temperature. Using techniques employed in the Marquee Industry the edges of the roof and wall panels are drawn through an aluminium bracket which is fiexd to the wooden beams and posts. The result is an easily removable solution which, when insitu, is draught free. The PVC fabric used for the panels are easy to clean, treated with an anti-fungal agent and UV stablised so that this product will look good for years to come without even needing a lick of paint! Transparent roof panels ensure that the courtyard remains light and spacious as well as hiding an unsightly staff stairway. The rough sawn wooden finish of the pergola structure complements the existing tables and chairs perfectly and adds to the look and feel of space. Above the wooden roof beams the Marquee Pergola is topped with structural aluminium framework, ensuring long term stability and giving an airy feel to the environment. In fact some customers request to sit in the courtyard in preference to the more traditional dining arrangements in the Inn itself.